The DeArmond tremolo of the 50s is a unique guitar effects box. It uses a small canister with an electrode inside. 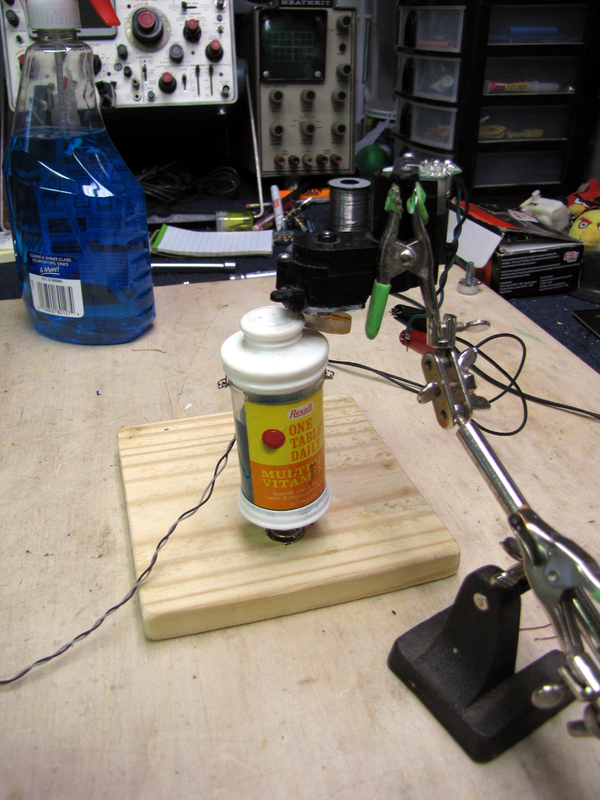 It’s filled with Windex which, along with the electrode, serves as the potentiometer that modulates the tremolo effect. The outer part of the canister is connected to ground and the inner electrode is connected to the guitar audio signal. The canister gets gently rocked back and forth via an eccentric wheel spun by an electric motor. As it rocks to and fro the liquid inside sloshes to and fro covering and uncovering the electrode. When the electrode is immersed in the liquid the signal is attenuated to ground. When I first saw this tremolo I knew I just HAD to try building one. After the usual brainstorming I hatched a plan. Of course, that plan took a very different turn a few times on the way to a working prototype. It uses a small gear motor salvaged from a Roomba vacuum to spin an eliptical wheel which wiggles the canister back and forth. 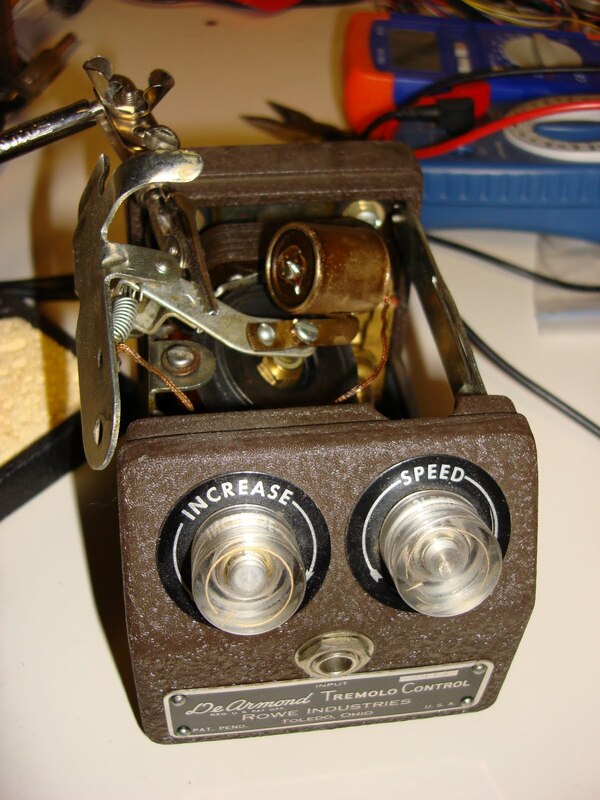 When more voltage is applied the motor speeds up and so does the tremolo effect. 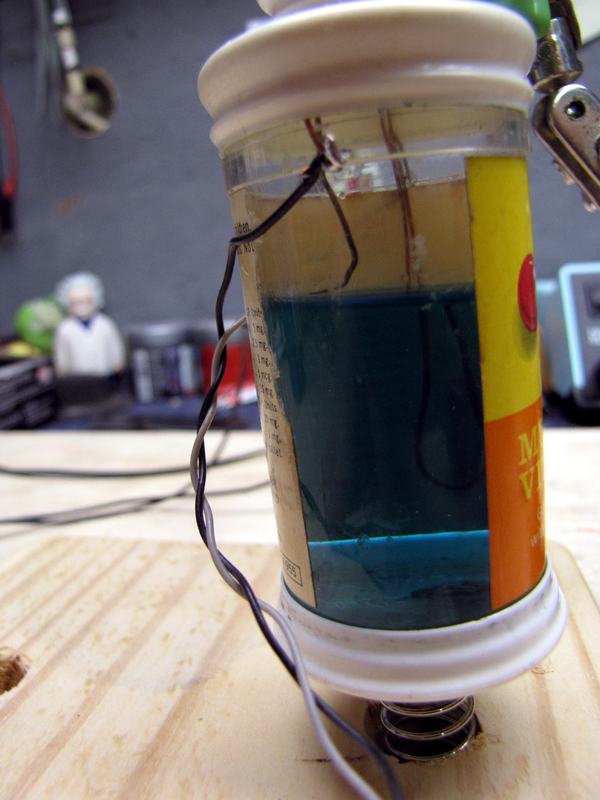 The canister of Windex with the electrodes installed. It’s a good proof of concept prototype. I’ll be doing more with this project in the future.